This small shop is hiding at the back of the Kings Walk Mall. It sells in a jumble a selection of only French labels for women. The brand names are not always well known but prices are kept down for these trendy outfits. 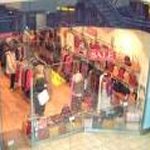 A lot of tops, skirts and handbags around £50.